It's one thing to publish an image of a typewriter owned by someone else. 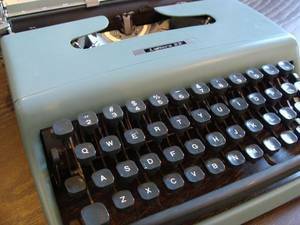 It's entirely another to use such an image under the pretence that not only does this typewriter belong to you, but that you are selling it to someone else through eBay. The very obvious implication here is that someone sees an image of a typewriter listed on eBay, likes the look of it, bids on it, wins the auction, then receives an item which is very much not the same as the one photographed in the listing. I don't know whether, or how often, this occurs elsewhere, but it is all too common on Australia eBay. I regularly report such infringements to eBay, but the impression I get is that little if anything is done about it. You get the standard response from eBay: "Thank you for your report ... [we] will thoroughly investigate the information you have provided [and] thoroughly examine this information and take the appropriate action if a violation of eBay policy has occurred. If you believe an item is potentially infringing and it was not removed by eBay, we encourage you to contact the rights owner and inform them of the alleged infringement. Rights Owners may request the removal of listings they feel infringe upon their rights through eBay's Verified Rights Owner (VeRO) Program ... We appreciate your concerns and thank you for helping to keep eBay a safe and reputable venue in which to trade." Trouble is, eBay's reporting process does not allow enough options, or enough of a character count, to properly describe infringements such as this. I will watch with great interest whether, with the latest reports I have made to eBay, anything is done about them. I suspect my success rate, to date, has been poor, to say the least. What brings all this to mind is that this morning two Olivetti Lettera typewriters were listed on Australian eBay by the same Melbourne seller, and in neither case was the accompanying photograph of a typewriter the seller actually owns. As I said, I have seen this type of highly misleading advertising before. Sometimes entire sections of Richard Polt's or Will Davis's websites are lifted and reproduced on eBay without either permission or acknowledgement. myTypewriter.com photos and words appear all too often with Australian eBay listings. I have had occasion to draw these indiscretions to the attention of Richard and Will, and also Charles and others, and I get the impression they are none too impressed by such behaviour, but feel frustrated and somewhat powerless to prevent it. A few months ago, I contacted Chuck Dilts because a Junior (Bennett) from his museum was listed for sale on US eBay. 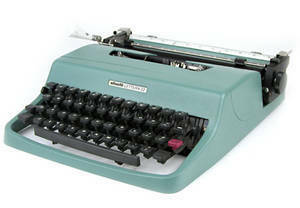 It may not have been the same typewriter, but the seller had simply lifted the image from Chuck and Rich's website, giving the very distinct impression that this was the typewriter for sale. Chuck said he appreciated me letting him know, and added he was pleased he had joined eBay's VeRO program. One would join such a program, I guess, if this sort of thing happened on a regular basis. Why do sellers do it? Too lazy to take their own photographs of the typewriters they are selling? Insufficient imagination to write their own description? All very well, but what thought is given here to the buyer? What happens when the buyer receives the item, only to find it is not the one that was listed? Let's face it, typewriters photographed for sale on myTypewriter.com are generally in almost immaculate condition - and that's how one receives them. It seems to me highly unlikely that one would receive a typewriter from an Australian eBay seller in quite the same condition as one would receive the same model from Charles Gu. OK, I've gone on enough about this problem. No doubt the same thing happens with many items, other than typewriters. But what should we do about it? The important issue here is not so much the lifting of images as the selling of items which do not match the images. As someone who buys an awful lot of typewriters and spends an awful lot of my hard-earned money on eBay auctions, I'd hate to buy a typewriter under the false impression I was getting a machine which was, in reality, already safely ensconced in Richard Polt's, Will Davis's, Charles Gu's or Chuck Dilt's collections. All I can suggest is that we be vigilant, and when such indiscretions become apparent, report them to eBay, rather than let them go by. Maybe one day eBay will take some notice. I am not optimistic about eBay's ever taking notice. They list millions of items, so even if hundreds of typewriter collectors complained, it would be a tiny drop in the bucket. When I see a particularly egregious misuse of one of my photos, I usually send the seller a "cease and desist" note, and they usually remove it. I think they're shocked, because it never occurred to them that they might get busted by the original creator of the image.